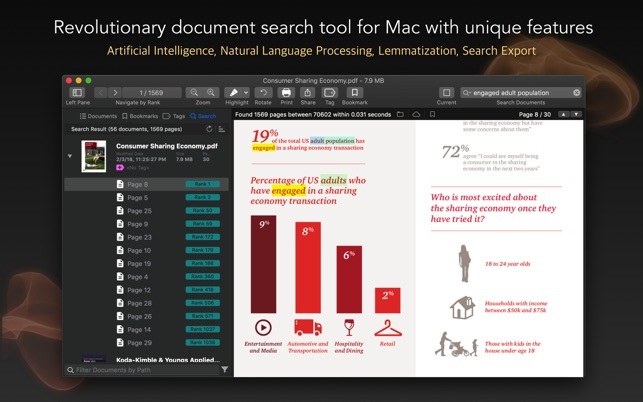 Search blazing fast through thousands of documents using the power of Artificial Intelligence. Make your work and school life much more productive and easier. Information is a key to success. PDF Search will help you quickly reach the information lying in documents using its AI-powered algorithm. Just search your documents, reference books or notes using it. Then feel the power of accessing any information within seconds. You will shine in meetings, classes or at work using your Mac, iPad or iPhone. Ordinary search tools search for existence. They only check whether your keywords exist in documents or not. Then they give you a bunch of document list. You check them one by one to understand whether they are the one you are looking for or not. There is no intelligence, just like a machine. 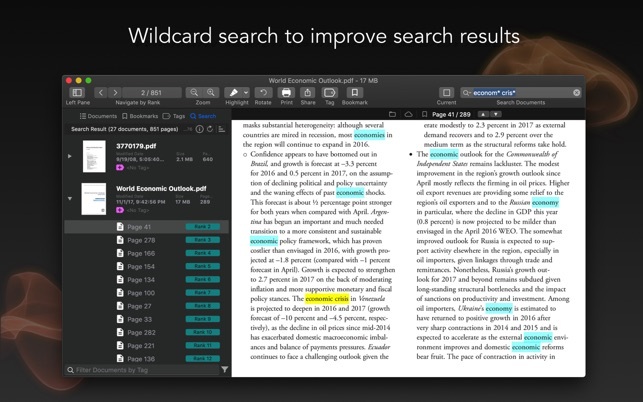 PDF Search makes intelligent search. Instead of checking the only existence, It analyses all pages separately and makes a relevancy check for each of them according to given keywords. This check is similar to how a human checks documents. For example, a human is more interested in a page if it has a title containing keywords. PDF Search combines all these kind of checks into a brand new algorithm. Using this algorithm, it finds the most relevant pages instantly among thousands of documents. PDF Search supports tokenizing and lemmatization while indexing. With this feature you will be able to search plurals or lemma of the keywords. For example when you search for "hike" you will get results for "hiking" also. Or when you search for "children" you will get results for "child" also. 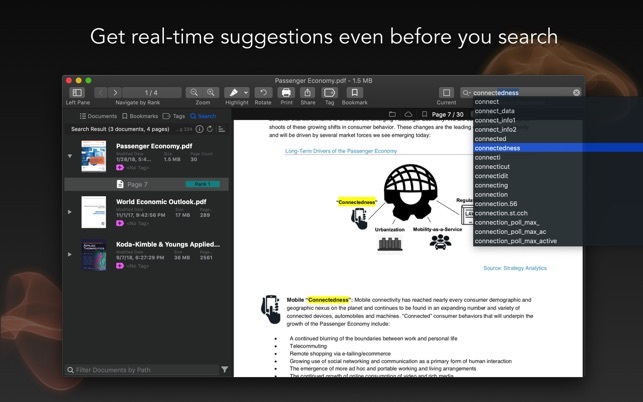 You can search documents on your Mac using iPhone or iPad. 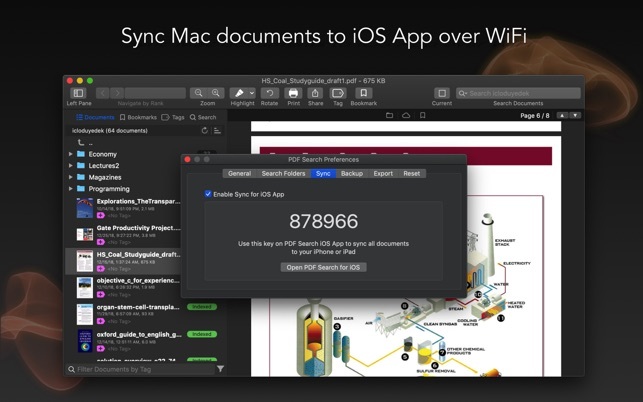 Just Sync your files over WiFi with a single click and move all documents with you anywhere. Word, Powerpoint, Pages, Keynote, RTF, Text documents and Source Codes are supported with the integration of PDF Converter. PDF Converter is a free helper app which you can download from our website. After you install it office documents are converted to PDF automatically and indexed by PDF Search. ● Synchronization between iOS and macOS app. ● Export search results as a new PDF document which is containing all best pages from most relevant documents. So you can share results as one document. ● Wild-char search ability to search words starting or ending with other words. 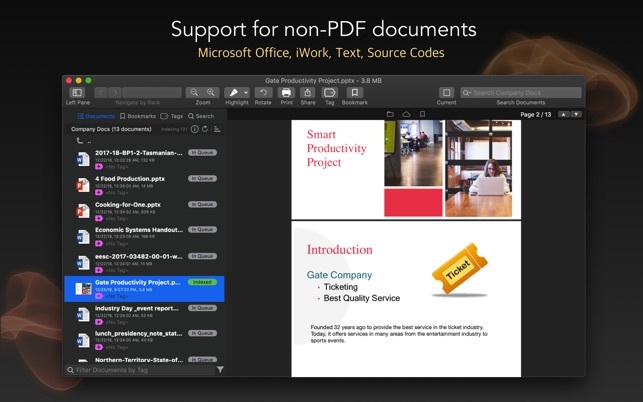 ● Support for Word, Powerpoint, Pages, Keynote and RTF documents with the integration of PDF Converter app. ● Ability to run as a window app or menu bar app. 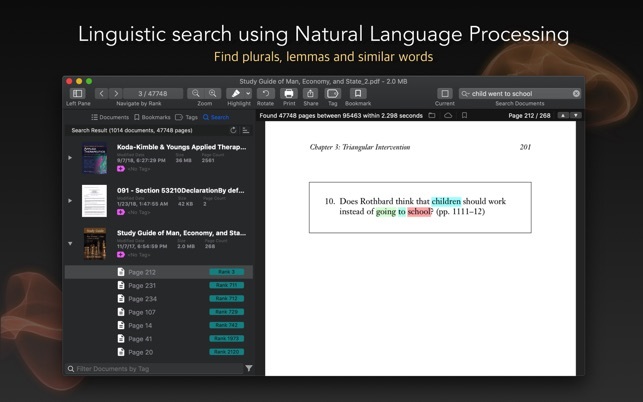 *Natural Language Processing is supported for these languages : Amharic, Arabic, Armenian, Bengali, Bulgarian, Burmese, Catalan, Cherokee, Croatian, Czech, Danish, Dutch, English, Finnish, French, Georgian, German, Greek, Gujarati, Hebrew, Hindi, Hungarian, Icelandic, Indonesian, Italian, Japanese, Kannada, Khmer, Korean, Lao, Malay, Malayalam, Marathi, Mongolian, Norwegian, Oriya, Persian, Polish, Portuguese, Punjabi, Romanian, Russian, SimplifiedChinese, Sinhalese, Slovak, Spanish, Swedish, Tamil, Telugu, Thai, Tibetan, TraditionalChinese, Turkish, Ukrainian, Urdu, Vietnamese. I very much appreciate PDF Search (currently using Version 1.7). I have thousands of PDFs on my computer, with quite a few folders holding the bulk of them. Years ago I gave up on the idea of tags; I saved PDFs faster than I could decide on what tags to use! Instead I depend on searches. What makes PDF Search so handy is its display of the documents located and their ranking, the display showing the first page of each document and, when selected, the document itself with search terms highlighted. Quite often that first page display alone jogs my memory of the circumstances that led me to collect it in the first place. 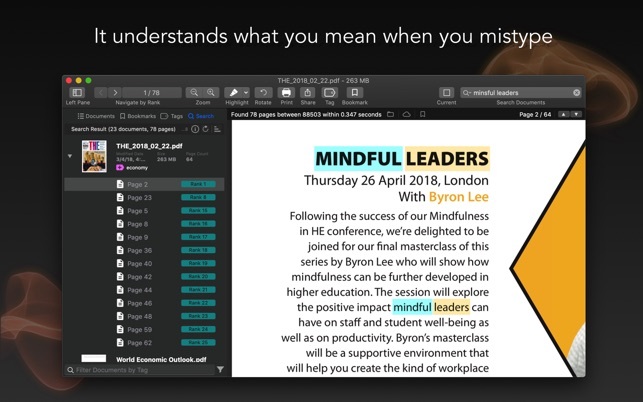 The indexing process itself takes some time for folders with hundreds of PDFs of course, but that’s hardly a problem because it’s happening in the background. This is a good tool to have on hand. I have several >1000 page PDF files, and searching them with preview was not working due to their size. 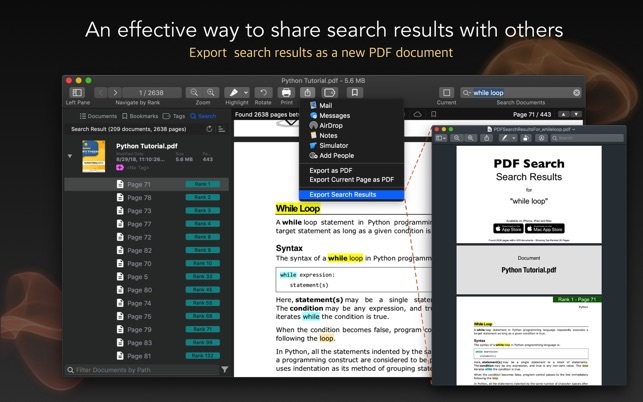 This is a great tool for searching through multiple large PDF files at once, very fast. Also syncs files with iPad/iPhone version of the app (additional $10 purchase). Worth it though. Crashes within 1 minute of launching, will not index all of my pdf’s on my 500 GB SSD internal drive let alone all of the external drives I still need indexed. Sorry for the bad experience you had. I really want to help for your case if you can submit through our support page. We may request some log files which may address your issue. Maybe there is a simple problem we can solve. Because PDF Search is used by many people successfully. Also you may try to download and run the PDF Converter app which is a helper for indexing. Best Regards. NOTE: With new version 4.5 we have addressed a bug causing crash after launch. Please just check that version if it is solving your problem.